MSNoise will be at IAVCEI 2017 in Portland! This entry was posted in News on May 9, 2017 by thomas. About 1 year after the last major release (MSNoise 1.4) we are proud to announce the new MSNoise 1.5. It is a major release, with a massive amount of work since the last one: in GitHub numbers , it’s over 120 commits and over 2500 lines of code and documentation changed or added! We have started to move core math functions to ObsPy, currently the only one ready is linear_regression , a function I wrote to remove the dependency to statsmodels, required to move mwcs to ObsPy later. The preprocessing routine has been isolated, rewritten and optimized. It is now a standalone script, callable by plugins. It returns a Stream object with all the data needed for the analysis. This change in preprocessing was done mostly to allow cross-component, auto- correlation and cross-correlation, with or without rotation, to be done with the same code. CC, SC and AC are now supported in MSNoise with proper whitening (possible to disable spectral whitening for specific cases). This documentation is now available in PDF too (easier for offline usage) and it also includes a new tutorial for setting up the MySQL server and Workbench. Last but not least: MSNoise is “tested” automatically on Linux (thanks to TravisCI) & Windows (thanks to Appveyor), for Python versions 2.7 and 3.5. With MSNoise 1.5 we also added the MacOSX tests on TravisCI. With these tests, we can guarantee MSNoise works on different platforms and Anaconda (or miniconda) python versions. Thanks to all for using MSNoise, and please, let us know why/how you use it (and please cite it!)! To date, we found/are aware of 25 publications using MSNoise ! That’s the best validation of our project ever ! See the full list on the MSNoise website. Lecocq, T., C. Caudron, et F. Brenguier (2014), MSNoise, a Python Package for Monitoring Seismic Velocity Changes Using Ambient Seismic Noise, Seismological Research Letters, 85(3), 715‑726, doi:10.1785/0220130073. This entry was posted in News on May 1, 2017 by thomas. Just over a year after the last major release (MSNoise 1.3) we are proud to announce the new MSNoise 1.4. It is a major release, with a massive amount of work since the last one: in GitHub numbers , it’s over 125 commits and about 5500 new lines of code and documentation added! To date, we found/are aware of 12 publications using MSNoise ! That’s the best validation of our project ever ! See the full list on the MSNoise website. This entry was posted in News on April 11, 2016 by thomas. We know it’s late, it’s the closing talk of the Session S34, but be sure to attend, some really cool stuff will be showed by Aurélien Mordret ! This entry was posted in News on December 14, 2015 by thomas. MSNoise 1.3 is Released ! 8 months after the last bugfix release (MSNoise 1.2.5), and 17 months after the last major release (MSNoise 1.2) we are proud to announce the new MSNoise 1.3. It is a major release, with a massive amount of work since the last release: in GitHub numbers , it’s over 100 commits and about 3500 new lines of code and documentation added ! MSNoise 1.3 introduces a brand new way of executing the workflow. The workflow in itself doesn’t change, so experienced users as well as new users reading the SRL publication will find their way easily! MSNoise is now a Python Package, allowing a single (and easy) install for all your projects and/or all users using pip install msnoise. The new top-level msnoise command contains all the steps of the workflow, plus new additions, as the very useful reset command to easily mark all jobs “T”odo. The msnoise plot command group which includes seven plots, all directly callable from the command line, without needing to hack/edit the source codes. About hacking: MSNoise has now a proper documented API which allows pythonistas to write their own plots, computation steps, …, while interacting with the database and the data archive! The “dynamic time lag” allows to use parts of the coda that is dependent from the interstation distance (provided station coordinates are defined). Finally, MSNoise is now tested and automatically checked by Travis-CI! This entry was posted in News on March 20, 2015 by thomas. Let me know if you use MSNoise ! This entry was posted in News on November 14, 2014 by thomas. !!! MSNoise Workshop at AGU 2014 !!! Hurry up ! 30 seats available ! This entry was posted in News on June 16, 2014 by thomas. I’m very pleased to announce that the paper Corentin, Florent and I submitted 1 year ago has finally been published in the Electronic Seismologist (ES) column in the May/June issue of Seismological Research Letters ! The great advantage of ES is that it is fully open access !! 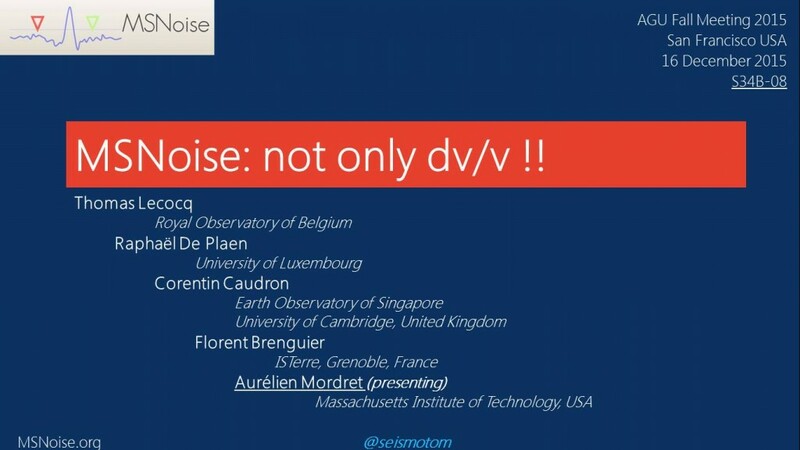 Lecocq, Thomas, Corentin Caudron, et Florent Brenguier (2014), MSNoise, a Python Package for Monitoring Seismic Velocity Changes Using Ambient Seismic Noise, Seismological Research Letters, 85(3), 715‑726, doi:10.1785/0220130073. This entry was posted in News on May 6, 2014 by thomas. scan_archive: there were major issues using Threads, this step uses Process for multiprocessing, which is much safer. The only problem remaining is that there is no more console-logging of the found/identified files. To be corrected soon. new_jobs: mostly rewritten, all jobs are properly identified now. There should no more lost jobs ! I've also reflected those changes in the documentation. This entry was posted in News on May 1, 2014 by thomas.